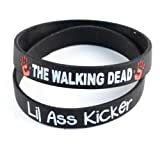 You've got the official zombie slayer bracelet. Now you just need a reliable weapon and a zombie infection outbreak. Black wristband with red and white color fill The band is debossed and then filled in with silicone for a long lasting imprint! Awesome lights and futuristic sounds. A laser light mounted INSIDE the barrel allows for accurately blasting enemies away. Lightweight and easy to hold makes it great for a quick draw if needed. With the Techege Forces of Valor True Hero 2 your kids imagination will be the limit. Turn your backyard into an intergalactic battlefield where your kids use the Techege True Hero 2 to fend off enemies from far away galaxies or maybe the interactive lights and sounds will make them feel like they can protect their siblings and neighborhood friends from zombies of the Wild West -or what ever else they may think of. Show off TARINA TARANTINO's signature style when donning a chic and sultry necklace from the ICONIC collection. Accented with crystals, this edgy piece gives your everyday look charm and personality.